Absolutely amazing!!! Can't wait to start with mine!!! I love this tut very detailed with good pictures I've been searching for on of these for months. The wig loooks awesome! 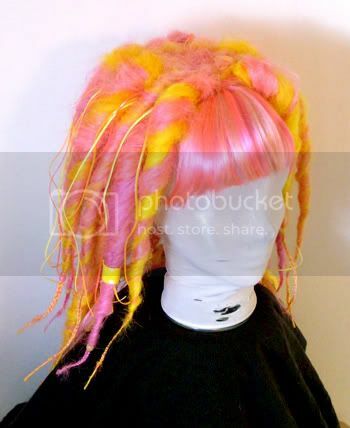 I am going to try and do one for myself, ive been making loose DE and SE dreads for years but never actually thought of attaching them to a wig. I just want to know, if any one can help... i would like my wig quite thick with lots of volue... would the weight pull the wig off my head? or will it stay quite secure even with lots of dreads?? ChazsManeAttraction wrote: I am going to try and do one for myself, ive been making loose DE and SE dreads for years but never actually thought of attaching them to a wig. Thats a great idea thank you , Its just when I have dreads installed I usually have loads in my hair about 80-100, I was going to make these dreads into falls, but they dont hold very well as my hair is not long enough for the bunches. So if I was to put these dreads to a wig, would it stay on my head or not very easily? Thanks for this, I shall be doing this soon. I love how it looked all knotted up, might do something like that at some point.